This Book that I have in my hands, I read each day. When I stand to preach, I preach this Book - this is the Bible! It is the Word of God. It is a Book so spe­cial that we treat it with the utmost respect. We hold it dear and precious to our hearts. It is not a Book like any other books which men have written. This Book came to us in a unique way. God Himself gave it to us. When I read its message, it is not the mere musings of a sage, a prophet or an apostle. It is instead the revealed Word of God. That Book? You mean the one we some­times call the Book of Books? Yes, dear Christian, the One whose trea­sured pages you open to read for hope and comfort - what is that Book you hold in your hands? 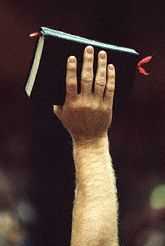 And, dear preacher, pastor or mission­ary, when you stand up to preach, what is that Book you hold in your hands? Is it "the Bible"? Is it really true? Can you rely on every word? In your darkest hour, is it a trustworthy source of support? Is it inspired? Is it accurate? Is it the pure Word of God? Or do you have a book that is only somewhat dependable? Is your Bible only eighty-five percent the Word of God? What, indeed, is that Book you hold in your hand? Psalms 12:6-7 says, "The words of the LORD are pure words: as silver tried in a furnace of earth, purified seven times. Thou shalt keep them, O LORD, than shalt pre­serve them from this generation for ever." Matthew 24:35 says, "Heaven and earth shall pass away, but my words shall not pass away." 2 Timothy 3:15-16 says, "And that from a child thou hast known the holy scriptures, which are able to make thee wise unto salvation through faith which is in Christ Jesus. All scripture is given by inspiration of God, and is profitable for doctrine, for reproof, for correction, for instruction in righteousness." Hebrews 4:12 says, "For the word of God is quick, and powerful, and sharper than any two edged sword." 2 Peter 1:20-21 says, "For the prophecy came not in old time by the will of man; but holy men of God spake as they were moved by the Holy Ghost." Critics Pound on it All the Time! You need not look hard to find a host of Bible-haters. From network anchors to Hol­lywood stars, from university professors to politicians, they are all over the place. They fight the Bible with a vengeance because its message conflicts with their wicked lifestyles and agendas. They relentlessly pound on the text with critical force. They believe it to be a threat to them, so they are aggressive and combative in their attacks. Religious Leaders Sometimes Denigrate it, Too! It is unthinkable that religious leaders who want to fly under the flag of Christian faith are also among the most harsh of crit­ics. But it is true. When they speak, they reduce the Bible to "the ideas of Moses or Paul," but they are not content that it should be the pure, unadulterated Word of God. Furthermore, they cannot stand still for the prospect of an inspired and pre­served text. The very idea insults their self-acclaimed scholarship. We all have our heroes, and we love to quote them, especially if they agree with us. However, sometimes even our heroes get it wrong. After all, they, as we, are human beings. Some try to explain things with poor choice of words or clumsily constructed sentences. In so doing, they add to the con­fusion and leave all of us wondering what is really being said. It is usually not a good idea to wade into water that is deeper than you can navigate. You yourself, as well as those who go with you, may find yourself adrift in turbulent waters when men of God are unclear in their teaching. Nowhere could this be more important than in our explanation of Bible textual issues. Others, though they be Christians, are tutored wrong, and they wind up believing and teaching what the liberals and others in the world teach. This is an especially scary prospect. After all, if we do not get things straight in regard to the Bible, what can we expect in regard to everything else? In an attempt to be "scholarly," it is very easy to foul things up, confuse the issue, and leave a lot of folds in some state of doubt. I think that should be avoided if at all possible. With this in view, I want to raise some questions that people keep asking. In so doing, I hope I can provide some insight and stability. It is not the words of men but the Word of the Almighty God, who is the Creator of the world. The human penmen were employed of God to write His very words. When we say it was given by inspira­tion of God, we mean that God Himself gave us His own words. That is why we use the terms verbal and plenary to describe what it is. Verbal has to do with His actual words. It is not just His ideas or concepts, but His words. When we say plenary, we mean inspired fully. It is not somewhat of God with the rest of it being man-made. It is in every sense a God-made Book. So let us sit up and take notice. This Book I hold in my hands is God's Book. It is the word-for-word, precisely expressed rev­elation of God. Absolutely! Let us stop the quibbling. Either you have the Word of God or you do not. If your Bible is the Word of God, then you have something totally unique and very, very special. What is your problem? Why do you feel the necessity to dismember, dissect and dilute the text? Why can you not just say, "My Bible is the Word of God; I believe it, I trust it and I honor it to the fullest?" Do You Believe in Double Inspiration? No, I do not! The Bible was inspired at the time of its writing. That is the claim of Scripture itself. Read the texts about the Scripture that I quoted earlier. God has preserved His inspired Word for us. It is preserved in the Hebrew Masoretic text and in the Greek Textus Receptus. It is also preserved for us in the English in the King James Bible. What He at first inspired, the Lord God has now preserved. Therefore, when I hold the King James Bible in my hand, I hold the inspired text. It was inspired and now that inspired Word has been protected, preserved and provided for us! Though the question of double inspi­ration is a legitimate one, and it is reason­able that it should be raised, that is not how we came to have an English Bible that is the Word of God. There are two concepts - inspiration and preservation. Because the Lord chose to do it that way, the English Bible I hold in my hand is the inspired Word of God! If what you have is not the inspired Word of God, whose word is it? If you do not have the inspired Word of God in your hands, would you kindly define for us what it is you think you have? If your Bible is not the Word of God, then I think we have a problem! Are Not Some King James Advocates Off the Mark? There is no question about that, but you cannot be accountable for everyone's wild ideas or spurious claims. As with any posi­tion we take on any subject, we need to be careful and well-studied so as to stand on our position in a responsible manner. I would not vouch for the claims of every King James Bible advocate. If he is carrying a King James Bible and using it, I am happy about that. If he innocently or ignorantly sounds off and says things that are off the mark, I hope we can help him to get his argument on a solid footing. However, do not turn your head away in disgust and refuse to acknowledge the validity of an inspired, preserved English Bible simply because you ran into someone who could not present a decent case for it because they made ill-advised claims about it. There are a few people in every family that cause frustration at the annual family reunion. We know them, and we always hope they do not make a scene. However, when they do, we do not revolt against the family. We may flinch when they show up, but we still go to the picnic. What I am saying here is that there is a strong, legitimate case to be made for the preservations of the Word of God in our English Bible. The fact that you do not like a particular advocate in no way disenfran­chises the issue. If someone does something ridiculous (as does happen) in this advo­cacy, let it reflect on him but not on the issue itself. What Is It That God Preserved? It is His Word, nothing more and noth­ing less! Remember Psalm 12:6-7 says, "The words of the LORD are pure words: as silver tried in a furnace of earth, puri­fied seven times. Thou shalt keep them, O LORD, thou shall preserve them from this generation for ever." Has the Lord Preserved His Word in Other Languages? Getting anything from one language to another is a very delicate task. It is a tedious work at best. I do not consider myself a lin­guist, so I cannot easily determine whether or not a particular translation in some other language is a good and true rendering of God's Word in that language. There is no question, however, that a variety of trans­lations in any language almost certainly assures that somebody has fouled some­thing up. But to answer the question "Has the Lord preserved His Word in other languages?" I believe the answer is, "Yes." There are times when the Bible issues of the text in a particular language take a while to settle. The ongoing debate over the Span­ish Bible is a case in point. I know good men - sincere, godly men - in the Spanish world who use the 1909 Reina Valera Bible and others who use the 1960 Reina Valera Bible. Their debate is often heated, but both sides feel that they have a good Spanish Bible. But there is one thing for sure: I cannot settle this for my Spanish" brethren. They want to settle it for themselves, and I believe they should. They know the Span­ish language; therefore, they must carry the responsibility to see that it is done. Out of the struggle, I am confident the Lord will work among them to preserve for them a good and true Spanish Bible - a pre­served text in Spanish. Amen! Why Do We Not Use Other English Bibles? Since God has preserved His Word for us, when two different Bibles say two different things, it poses a major prob­lem. If they are different, at least one of them is incorrect. I simply do not want my Bible to be a source of confusion. In the second place, there is a logistics problem. Almost all English Bibles which have come into being in the past 125 years are based on the Westcott-Hort texts. The Westcott-Hort texts are frankly spurious texts in that they have been tampered with. Scrivener, a contemporary of Westcott and Hort, produced a Textus-Receptus New Testament Greek text in which he documents that Westcott and Hort changed the New Testament text 9,970 times. They amended! They emended! They deleted! They added things! They literally pilfered the Greek text. It is therefore my conclusion that no matter how sincere or how skilled the translators, if you have them work­ing with a bad text, you will come out with a bad English version. In almost all cases when someone pro­duces a new English text, his motivation for doing so is either bias or bucks! That is, he either has a doctrinal agenda he is trying to accommodate or he is trying to make a dollar. In some instances, it has been bias and bucks! If you do not have a Bible that is your standard text, the consequences are going to be costly. Where there is not a standard text, the preacher and the people are never quite sure of anything. If they are sure, they do not know why they are. The problem is, they do not have a Bible to which they can turn with confidence and certainty. In the absence of an authoritative Bible, the people will not become strong Christians. They will drift and shift because necessity for an authoritative text that is, in fact, the Bible! It seems that so many clergymen these days are on a campaign to bring both Christ and the Bible together into terms where they can be humanly explained. That is some­times referred to as "higher criticism" in theological circles, but it is in reality taking "a low view", a dim view of both. What our world needs to see is the deity of Christ. What they need to know is God has spoken to us. What He spoke is recorded in the Bible. It is pure, precise and power­ful! It is authentic, accurate and authorita­tive! It needs no amending or adapting! It is the Word of God. A speaker who does not properly revere the Bible brings shame and disgrace to him­self and his hearers. Dear friend, if you cannot hold the Bible in high esteem come Sunday, please permit someone else to manage the pulpit for you. I believe it is the preacher's job to make much of Christ Jesus. I also believe if he has a lessened view, “a low view”, of the Scripture text, he will not likely do much about the Saviour. If he devalues one, he will almost certainly diminish the other. In very real terms, Christ and the Bible are inseparable. Do not tell me you want to praise the Lord while at the same time you are not sure of the legitimacy of some parts of the Bible. This just does not compute. If you love the Lord, you will not dispute His revealed Word! Any "humanizing" of Christ to the exclu­sion of His deity or the Bible is a spurious practice. Both of them should be exalted in every way. Hold the banners high. Amen! What About "Correcting the Text?" None of us who love the Bible and believe that God has preserved His Word for us are in the business of "correcting the text." We believe the text! We honor it! We hold it to be trustworthy in detail, so "cor­recting" it is not what we are about. However, let me quickly say that there is nothing "corrective" about defining words, explaining the text, and in general, getting at the intended sense of what it says. "Correct" the text we do not do, because we believe it is already correct. God in His omniscience and by His omnipotence has first provided His Word and has now preserved it for each generation. Is the King James Text Reliable and Trustworthy? It is indeed! About your King James Bible you can say it is authentic, accurate and authoritative. It is God's Word preserved for us in English. It is true and trustworthy. The inspired text has been preserved for us; therefore, it is inerrant and infallible. Why Do Preachers Refer to the Hebrew and the Greek? Very simply, when the Lord gave us His Word, He gave it to us in Hebrew (the Old Testament) and Greek (the New Testament). There are times when I may not under­stand a text. I am at full liberty to use every resource to facilitate my understanding. After all, if our claims for inerrancy of the text be legitimate (and they are), then there should be no conflict between the Hebrew or Greek and our English text, the King James Bible. I know that sometimes we preachers get a bit cocky with our knowledge. Undoubt­edly all of us have strutted about sometimes because we held possession of informa­tion (like the languages) that the people in front of us did not know. That's unfortunate when it happens. And it is frustrating for the hearer. But the other side of the coin is this. I want to know the whole truth of the Scrip­tures. So if a preacher's utilizing the languages sheds light on the truth, I say let him utilize. I love my English Bible, and I hold it in high esteem, but I also have a great delight in the Hebrew and Greek texts. Both are the Word of God. Amen! You should also remember that the Eng­lish Bible came to us via the Hebrew and Greek texts. We have the English Bible today because the Lord first gave us a Hebrew and Greek Bible! Not everyone can or does explain things adequately or accurately, but his ineptitude should not deter us from sticking and stand­ing! You will not like what everybody says or does, but don't let it discourage you or detour you. Align yourself in a church where there is no question about the authen­ticity, the accuracy and the authority of the Bible! Read the Bible! Study the Bible! Memorize the Bible! Preach and teach the Bible! Witness and win souls with the Bible! Embrace the Bible! Lift It high; exalt It!